With the evolution of photographic technology, the line between professional camera and consumer camera had become quite thinner. In fact, there had been a term popping up called Prosumer cameras– which is eventually a blend of both professional and consumer graded cameras. For this discussion, we won’t take you through this sort of confusions. So, let’s assume any cameras with ¼” chip size as professional cameras. Using a professional camera starts with learning how to do the manual operation in a professional camera. If you’ve been familiar with the manual mood of a Handycam or SLR cameras, that would be easier for you to adapt with. Setting the camera’s exposure and aperture. Learning to understand the depth of field and how to use it. Variating among different shutter speeds and learning the effects. Being familiar with camera gain and how to avoid that. Making a balance between aperture, shutter speed, and light availability. How to expose the camera to a difficult subject. Moving forward, you need to learn how to deal with different subjects and shot compositions. No matter it’s indoor, portrait shot, landscape shot or a moving shot, shot composition is what resembles your story. To learn how to use any given space and background. For interviews, wide shots, landscapes etc, learning how to compose images. To learn close-up shots, medium shots, and wide shots. Learning the difference between good and bad framing. Learning to do experimental framing and positioning of subjects. Now, we are at one of the most important aspects of any kind of work professionals do with the camera, and it’s the ‘light’. To know how to make light work for you can change a simple shot into a masterpiece, and vice versa. How to use a simple key light. Ensuring the perfect color balance and combination. Learning to use light reflectors. Apart from this list, there are tons of other skills that are needed to master on light-works. Professional video recording isn’t only about interviews and stage shows. Sometimes, you need to move with the camera itself to record a moving subject-line. A number of accessories and assisting products come up to help at this point. So, you might have to cost some money as well. Learning how to work with tripods. How to use various movement of a camera. How to hold a shot. Coping up with rail-movers, cranes and other sorts of assistance. 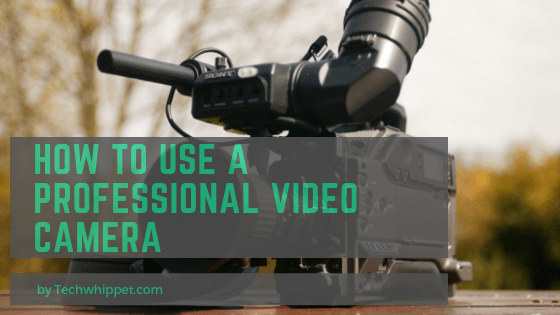 Although it’s not a direct part of videography with a professional camera. But every filmmaker has to bother about the sound quality and technologies to do that. Microphones, it’s types and uses. How to acquire good sound input. Deduce noise and unexpected distortions.